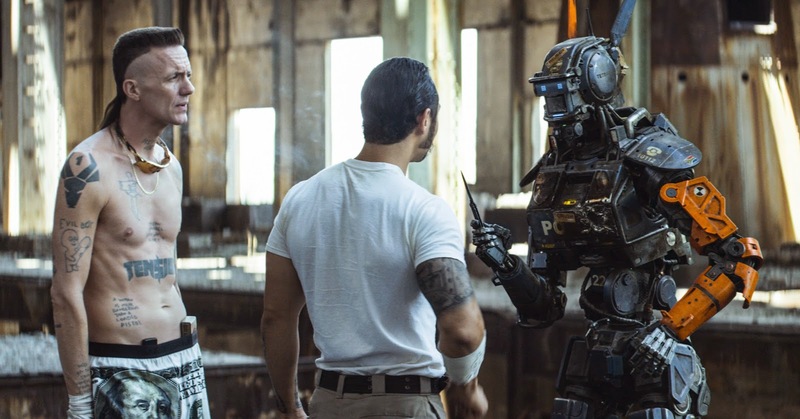 It takes genuine, unfettered talent to produce an experience as depressingly unpleasant and ugly as Chappie. Whereas a studio hack might manage to crank out an ill-conceived, forgettable mess that mirrors this picture’s traffic jam of ideas and themes, only a talent as bright and promising as Neill Blomkamp is capable of dragging you into the chaos and provoking strong, repulsed emotional reactions. This is a sad case study of creative genius gone horribly awry, resulting in a punishing exercise in hubris that cockily swaggers across the line separating bad from flat out offensive. How did we even wind up here? Back in 2009 when District 9 hit, Blomkamp seemed like an exciting powerhouse on the rise. Sure, there were warning signs of the writer/director’s action-over-thoughtfulness leanings present in that Oscar-nominated best picture contender, but his dedication to hard sci-fi trappings, grounded and intense fantastic imagery and technical virtuosity felt so fresh and invigorating. And while 2013’s bumpily scripted Elysium fell short of lofty expectations, there was nonetheless a lot to admire in the scrappy, Verhoeven-inspired crazed social commentary and hyper-violence. Perhaps Chappie, Blomkamp’s unnecessarily aggressive artificial intelligence fairy tale, is just a natural evolution of his increasingly problematic screenwriting shortcomings and intense style-over-substance attitude. Success and diminished outside authoritarian influence has certainly created many a monster (take a bow George Lucas and M. Knight!) in the past, after all. It’s just unfortunate there weren’t more highlights along the journey to this dire point. The latest chapter in the helmer’s futuristic Johannesburg series (it would be nice to say final, however talk of a District 10 have recently started anew), Chappie again returns us to the dusty, despairing streets and crumbling dystopian urban decay of the large South African metropolis, where punky criminals battle it out in the streets and law enforcement depends solely on superior firepower. Fortunate, then, that weapons manufacturer Tetravaal has recently sold a line of shoot-first-ask-questions-later armored robots to the police department in an effort to subdue the explosion of anarchy. Designed by Deon Wilson (Dev Patel), these mechanized peacekeepers prove exceedingly efficient in the war on crime, much to the chagrin of the increasingly frantic criminal population, as well as the young inventor’s unstable robotics engineer colleague Vincent Moore (Hugh Jackman), who vehemently opposes the concept of justice being decided by machine minds. After a late night energy drink-driven development session, Deon finally cracks the code for complete artificial intelligence. Yet, despite his insanely profitable achievements, Tetravaal’s business-minded CEO (Sigourney Weaver) sternly guns down his hopes to develop a prototype ‘bot able to think and express itself, forcing him to conduct the experiment on the sly with pilfered parts. Alas, on his commute home he’s nabbed by a street gang (headed by the South African rave-rappers Ninja and Yolandi Visser of Die Antwoord fame), who demand the robot be activated and surrendered to them. 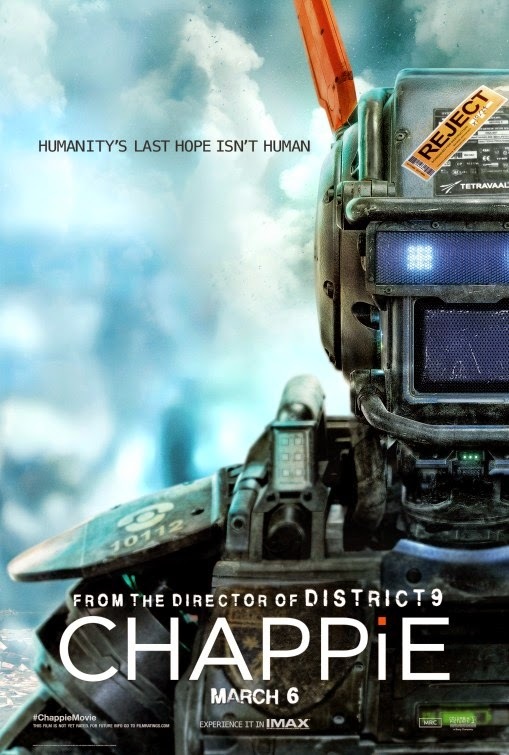 Once the switch is flicked on the bucket of bolts, Chappie (Sharlto Copley) is born; an innocent, impressionable construct who observes life through timid digital eyes. Forced to mature rapidly in a pitilessly rough and merciless environment, the newborn first-of-his-kind fast finds himself torn between the intelligent, compassionate ideals of his maker and the nihilistic, felonious attitudes of his adoptive parents. With only a five-day lifespan, our hero soon becomes determined to extend his mortality, even as Moore plots to cut it even shorter by initiating his own hulking man-driven weapon of unstoppable mass destruction. As a work of special effects blended with performance, Chappie himself is utterly convincing. Photo-real, expressive and moving with recognizable weight and authentic clunkiness, he’s an instantly iconic character who quickly grabs our sympathy and affection. Which, strangely, becomes a serious issue and fundamentally breaks the movie before it even really gets going. From the get go, we’re told that this robot, metal frame aside, is a child; vulnerable, helpless and without understanding of the world around him. Immediately upon activation, he cowers in fright behind furniture and has to be gently coaxed out by Deon and Yolandi (this doesn’t really make sense logically, but whatever). Given this presentation, it boggles the mind why Blomkamp feels so compelled to relentlessly mistreat this character, beating the audience into submission with each successive scene of Chappie being verbally harassed, smashed with pipes, fire-bombed and – in a scene so wretchedly cruel it’s bizarre – being dragged terrified into a van and viciously tortured. There’s an exploitative lingering mean-spiritedness to the film that’s troubling, as if viewing non-stop torment will inspire us to cheer harder for the protagonist. It doesn’t. Unlike his spiritual ancestor Pinocchio, we never witness the moments of true love and warmth that see him through the darkness. This is that famous tale filtered through the warped sensibilities of that kid who dismembered action figures in Toy Story. 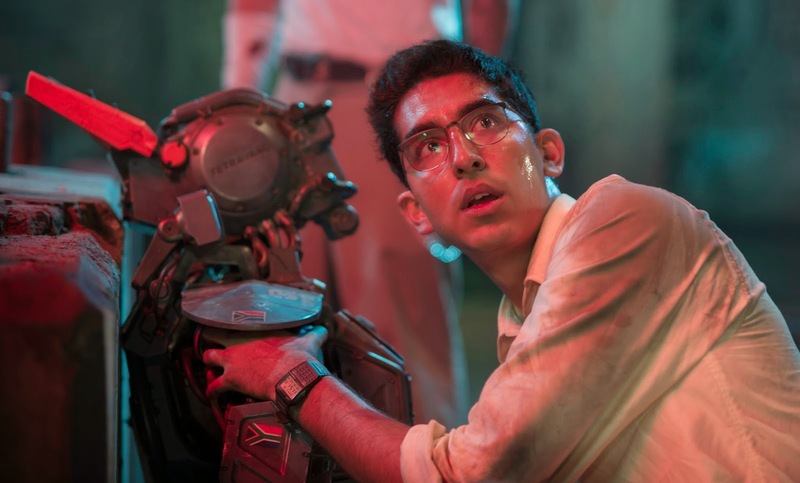 If Chappie is an ill-used conceptual triumph, the humans are a total lost cause. Patel exudes earnestness and intellectualism, but Deon is another one of those silver screen scientific wunderkinds who only make stupid decisions, while Jackman spends his hammy minimal screen-time glowering over his cubical wall, viewing events taking place mere feet away through binoculars and, most memorably, holding a gun to a coworker’s head in a crowded office with zero repercussions. As for Die Antwoord, they make credibly unsavory, obnoxious abusive movie parents you can’t wait to see eliminated. Too bad we’re actually supposed to root for them. Blomkamp reliably brings no shortage of characteristic visual flare to the picture (he can make even irredeemable junk like this look fantastic). As a writer, though, he’s scattered in a thousand directions like a cluster bomb. Sharing duties with District 9 collaborator Teri Tatchell, he seems unclear what his movie is even about. The science is introduced as being realistic, yet quickly becomes absurd (“uploading consciousness.dat”), and there’s not much interest in seriously exploring themes of artificial intelligence, mortality or nature vs nurture. Instead, characters bluntly verbalize awkward messages as the film noisily shifts gears like an out of control freight train. Maybe the director sensed there were issues, given his reliance on ripping off now classic plot elements from his debut. Hey, it worked the first time, right?! As awful as this disaster is, though, there’s still reason to believe Blomkamp can deliver the goods. Many A-list directors have stumbled badly after capturing greatness and achieving unprecedented power. Spielberg had his 1941, Ridley Scott made Legend and Peter Jackson bestowed upon mankind The Lovely Bones. Hollywood is a forgiving town, so hopefully the helmer can get his boundless potential and skill under control again and focus on a project that taps into what made him such a unique discovery in the first place. Because, lord knows, another malfunctioning miscalculation like Chappie could send anyone on a one-way trip to the career scrap compactor.